Madera County’s museum houses fossils from the 1993 Fairmead Mammoth discovery. Inside the main entrance of the Fossil Discovery Center, the visitor gets a glimpse at a reproduction of a Columbia Mammoth. That generally drops the jaw of a typical school aged explorer. “The students are amazed as soon as they walk in through the main entrance,” staff person Dawn Guthrie says. We’ve been reading and hearing a lot about the Fossil Discovery Center of Madera County. The organization is in the middle of a big project with three Madera County Rotary clubs to restore the former Mammoth Orange stand to a site on the Center grounds. The Orange Mammoth stand restoration is drawing attention to the Center’s work of supporting and promoting paleontology. The Center was built in the years following the discovery of mammoth fossils at the site of the Fairmead landfill. The landfill is across the road from the museum entrance. The San Joaquin Paleontology Foundation was formed in 1993 shortly after the mammoth fossils and others from the Pleistocene era were discovered. Support from the Madera County Board of Supervisors and grants made the construction of the facility possible. Since opening in 2010 the Center has hosted an estimated ten-thousand students annually who come in buses from area schools. The Center’s Executive Director Michele Picina is a retired school principal from the Madera Unified School District. She’s always had an interest in archaeology, so when the opportunity to serve the Center came her way, she jumped at the chance. The Center gets visitors from all over California, with most of the school student patrons coming from Madera, Merced, and Fresno Counties. A typical school tour divides the class into four sections. Each section is assigned a docent and a portion of the Center. The sections rotate so that every student sees everything the Center has to offer with no one feeling as though they are lost in the crowd. Students view where fossils are brought in for examination by paleontologists. As anyone with a passing interest in the physical sciences knows, this work requires time and patience. The Center is helped by volunteers; many of them have a background in paleontology. In another section, a visitor can see some of the fossils that have been recovered from the Fairmead landfill site. More than fifteen-thousand fossils from the site have been found since the first discovery in 1993. Fossils from the Fairmead discovery site are locked behind glass cases. Those exhibits are considered fragile and best handled by experts. There are plenty of things to see and explore outside the Center building. Behind the building is the Pleistocene Water Resource Exhibit. The exhibit is certified by the National Wildlife Federation as a Wildlife Habitat. It presents a scaled down experience of what the terrain in this part of the Central Valley might have looked like in the Pleistocene era. There is a re-creation of a Yokut house near the Water Resource Exhibit. Valley Yokuts were the largest Native American tribe in California with an estimated sixty-thousand living in the region. A house like this one is made from fourteen thousand tules and would take approximately one-hundred-twenty-five hours to build. On the side of the Center is a simulated archaeology dig site where children can try a special kind of hands-on science. The digs allow students to experience what the real scientists experience in the field. Over the years, the Center has added new features to enhance the visitor experience. A recent partnership brought in a display that explores water in the San Joaquin Valley. The Center also has a strategic alliance with the Sierra Mono Museum in North Fork, Madera County. 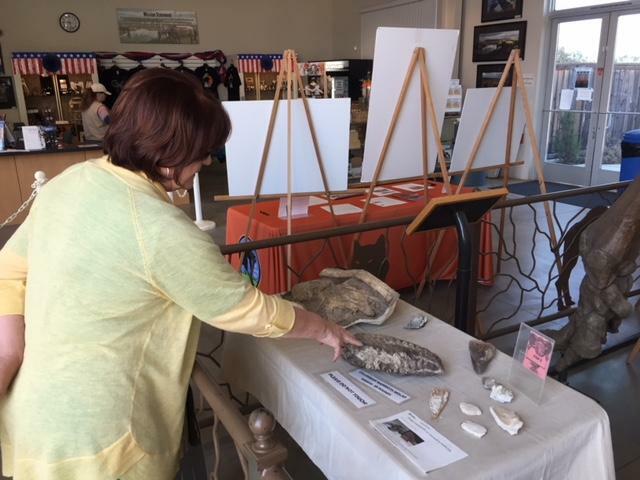 The Fossil Discovery Center of Madera County was founded as a natural next step for the San Joaquin Valley Paleontology Foundation. And don’t forget the mammoths. Columbia mammoths define the discovery of the first bones in the Fairmead landfill site from 1993. So popular was that discovery that the orange stand on highway 99 was named the Mammoth Orange hamburger stand. 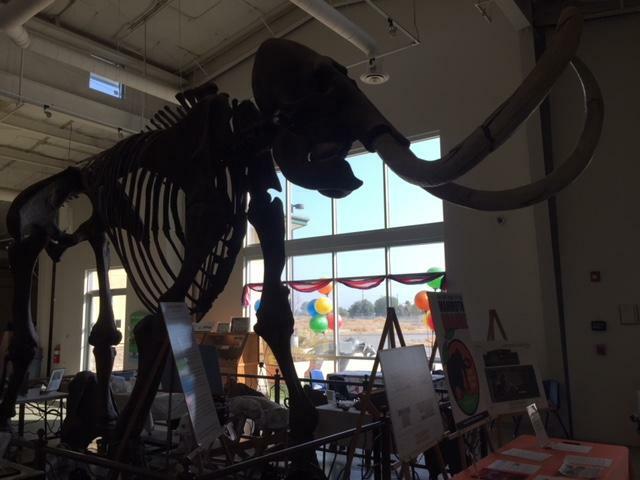 The Fairmead area embraced the mammoth discovery back in the 1990s, and the Center is doing everything it can to maximize the connection between that discovery and the future of the facility. The Foundation would like to see steady increases in the numbers of school trips to the Center, and more visitors from throughout California. The Center recently hosted Madera County teachers for a reception to kick off the new school year and to showcase the offerings. The facility is available as a meeting and conference space to the public. Expansion is always a possibility if the demand for more visitor space grows and financial support increases. The Center is positioned as a community resource. So if you haven’t experienced seeing the wide eyes of a child brighten up to the sight of a life-sized mammoth skeleton reproduction, come and see it yourself. You will see why the Fossil Discovery Center of Madera County is making history in the Central Valley. Join the Center for Fossil Fest on October 20. Free admission and a free pumpkin for the first 100 families.